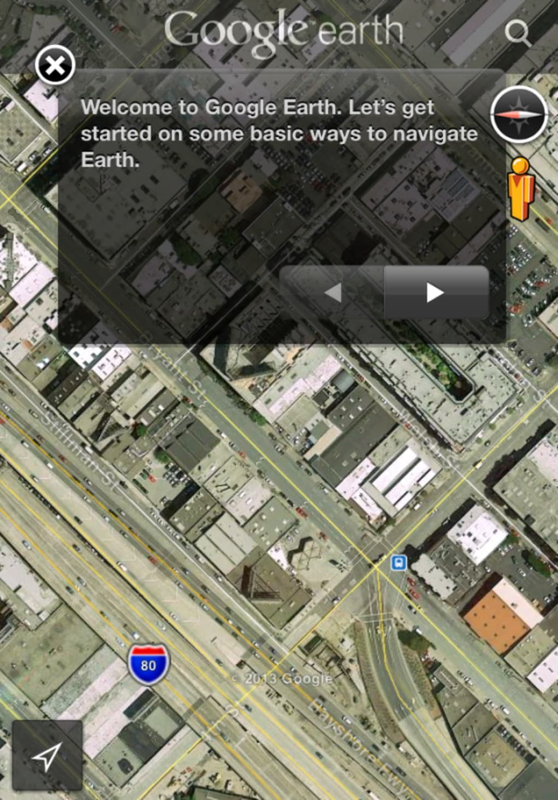 Google Earth for iOS, allows you to navigate the globe from the comfort of your Apple device. 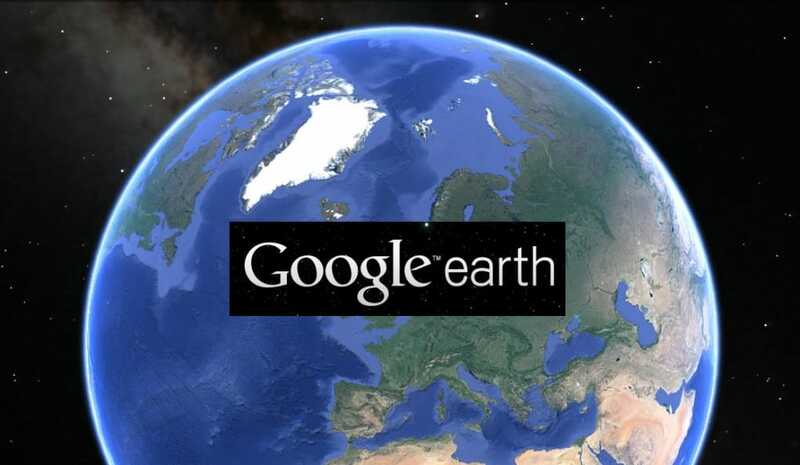 The application uses the same satellite and aerial photography found in the desktop version of Google Earth, only this time you navigate the globe simply by swishing your fingers across the screen. 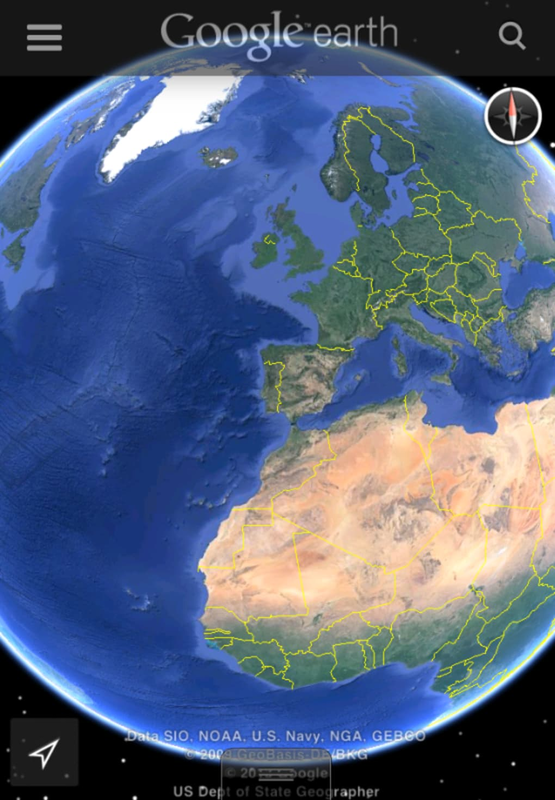 Google Earth for iPhone is great for finding your way around the planet. 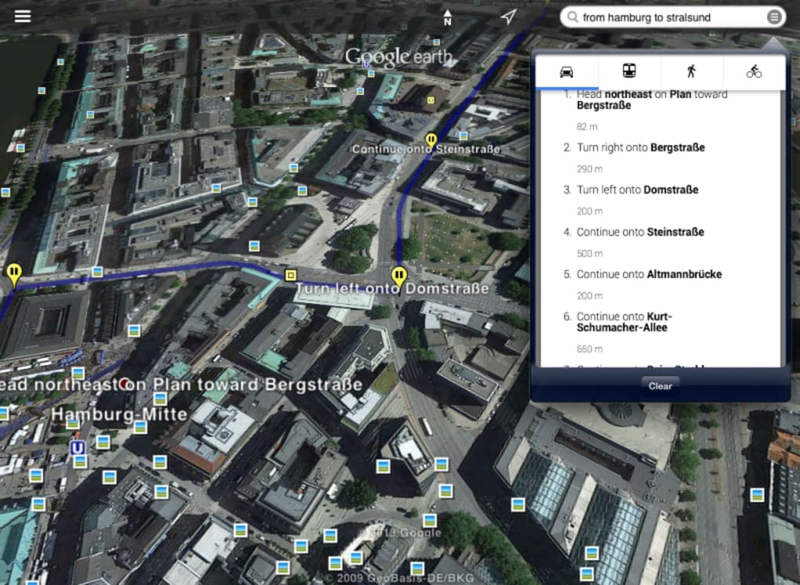 It can detect your current location and automatically centers the map on this point when you hit the Location icon. You can search for addresses anywhere in the World, as you would with the desktop version. Getting directions in Google Earth for iOS from point A to point B is much less easy than apps like Google Maps and Apple's own Maps app. It's not immediately obvious where to find directions. They can actually be accessed by searching "From start point to destination" in the search box. 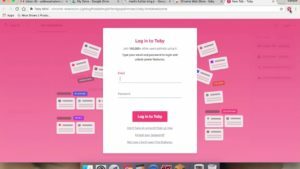 You can then get step-by-step instructions in the pop-up window. 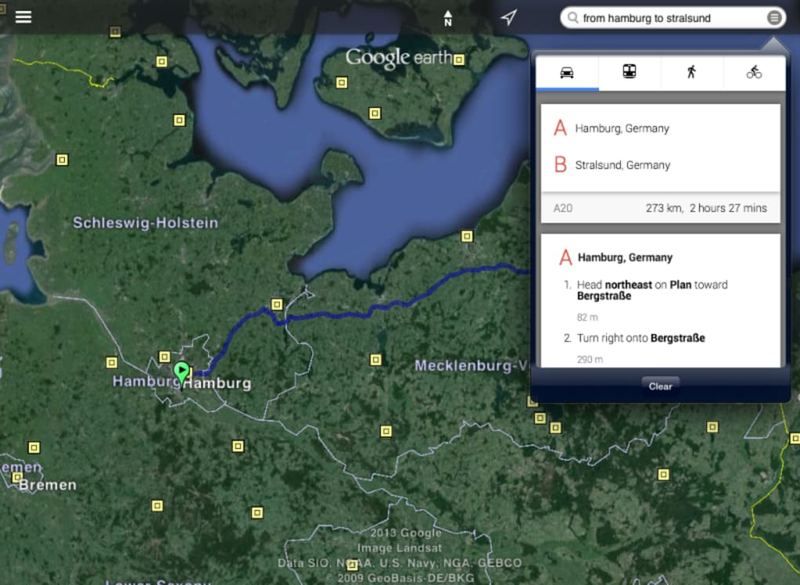 You can visualize the route in the map depending on if you're traveling by car, on foot, public transport, or bicycle. However, there's no way to drop a pin in a certain point and get directions from/to there. 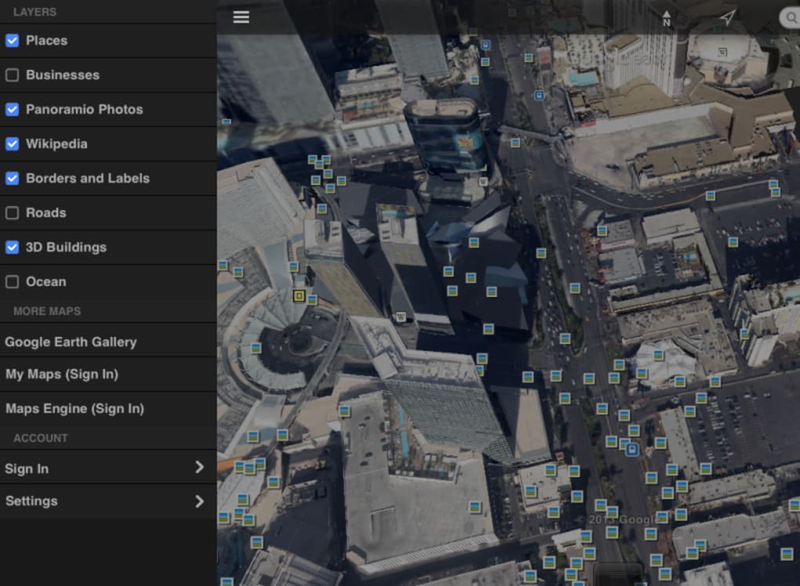 Google Earth for iOS has a facility for perusing Places, Businesses, Wikipedia articles and geo-tagged Panoramic photos. These can be added as layers, so lots of information can be overlayed on a map at once. 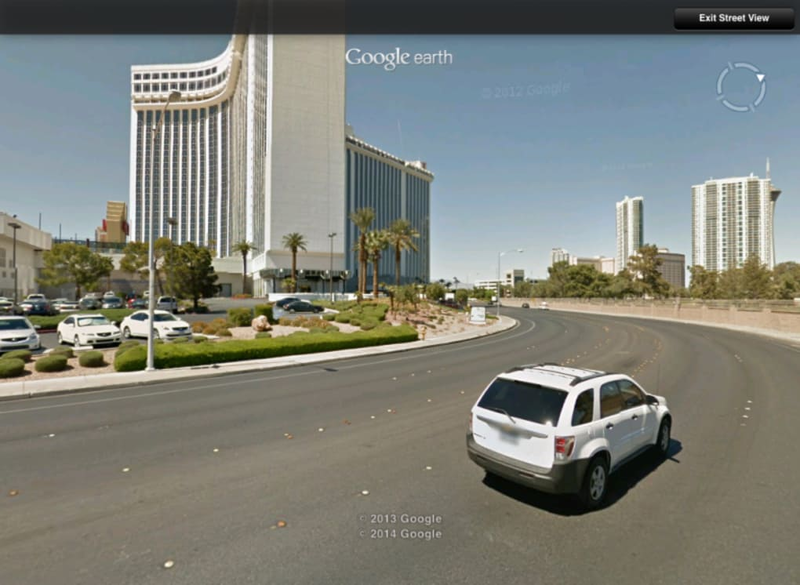 Google Street View support is included too, allowing you to get a close-up view of individual streets. 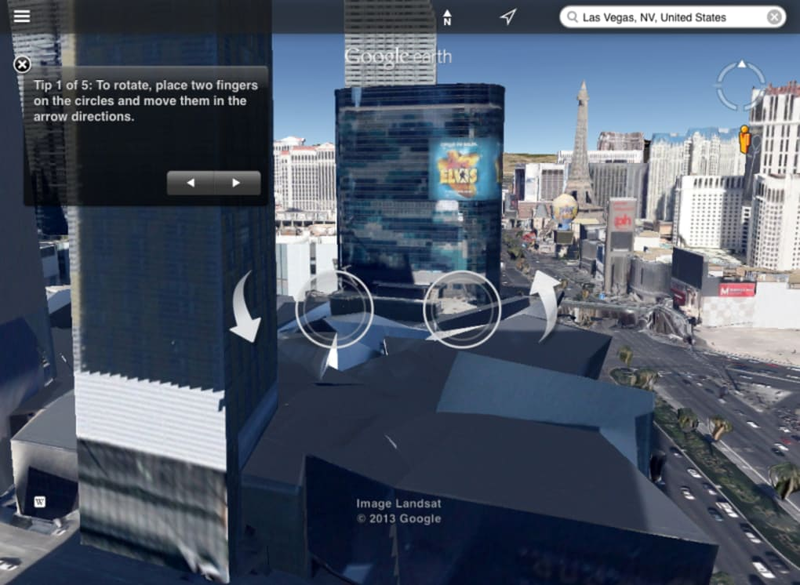 There's also support for 3D views of certain cities. 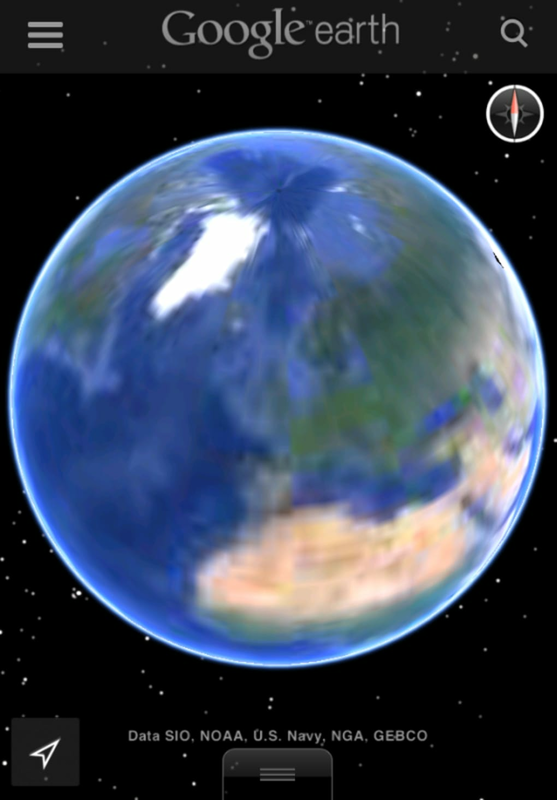 Google Earth includes the ability to view maps created on your desktop computer on your iOS device, which is a nice idea. It's advisable to have a look at the controls system in the program's Tutorial section before you start using Google Earth on your iPhone or iPad, because some of the commands aren't immediately obvious. .
You can swipe the map in any direction to move around, pinch your fingers to zoom out, tap on a spot to zoom in, or make a circular motion with your fingers to rotate the viewpoint. You can even view the lie of the terrain just by tilting your iOS device. Although the controls seem simple, in practice they are quite unresponsive at times. Depending on what you're looking at, navigation can be quite choppy, making honing in on a precise spot pretty infuriating. This is especially true of older model iPhones and iPads. Google Earth is a powerful tool for helping you explore our planet whether for research or just curiosity. The user experience of this iOS version could be smoother, though. Tuneup360. I think an easy way to keep your computer from running Slow is to install a PC protector or cleaning, according to my personal experience, Tuneup360 is good choice, and your computer takes only 30 sec to start up if you have it!!! 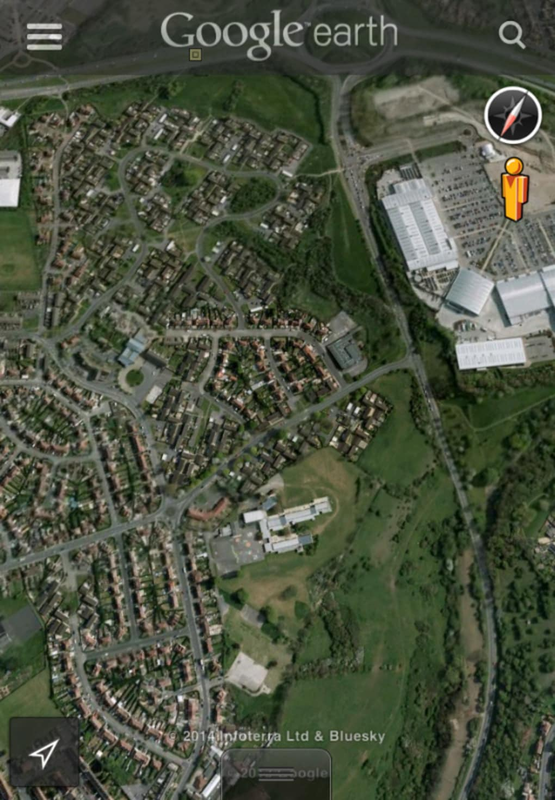 Find Places Near You From A Satellite Point Of View. 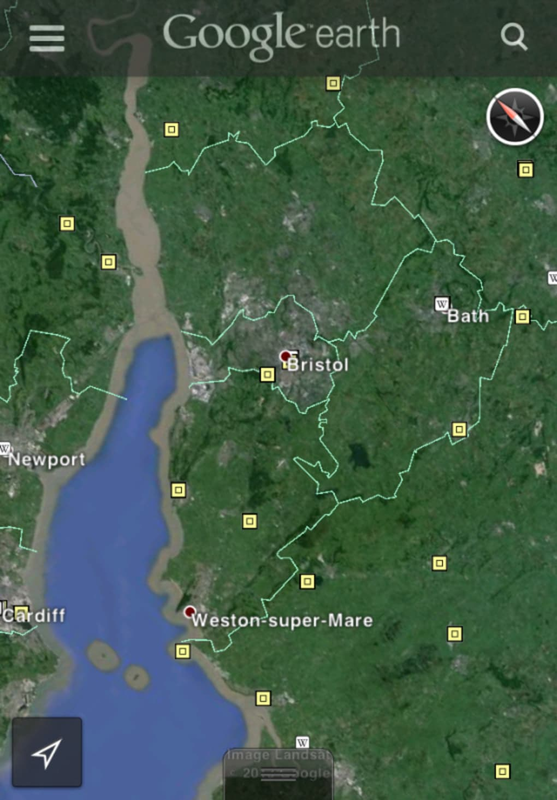 Google Earth allows you to have a satellite view of your location, it can even zoom in enough to show you a 3D street view of your location. It also allows you to search for your favorite places that are close to you. It even gives you information about the places. The only downside is it can drain your battery and while it has details, the details of your favorite places isn't as detailed as other apps such as Yelp or OpenTable. Overall Google Earth is a great app that gives Google Maps a nice much updated 3D point of view. And while it's not as complete as other apps when it comes to reviews and details, it's enough for most users. Can Adjust View By Simply Touching The Screen. Can Find Places And Give Details Of Places Near You. Reviews And Details Of Places Not As Complete As Apps Like Yelp. 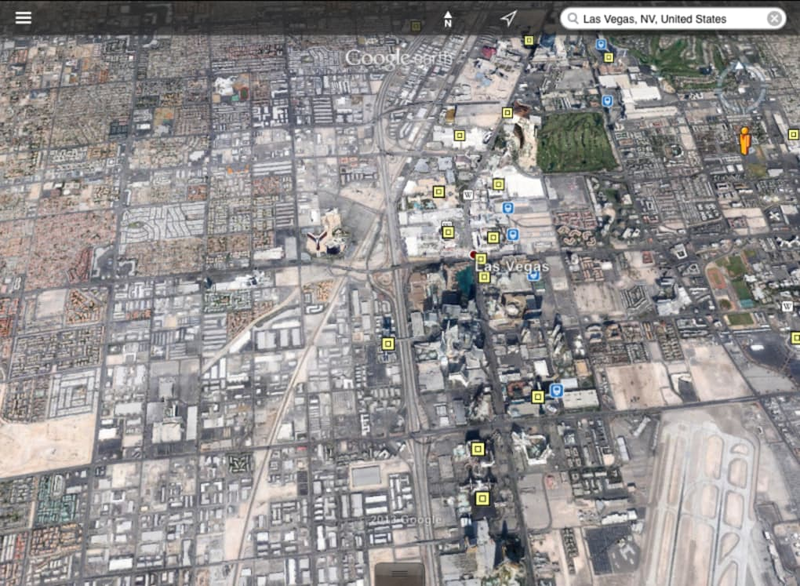 What do you think about Google Earth? Do you recommend it? Why?